Idaho residents 21 and older will soon be able to carry concealed guns without permits or training under legislation approved by Gov. C.L. "Butch" Otter. The Idaho State Journal reports that Otter signed the bill on Friday, but not without expressing concerns about the new law lacking a training requirement for those who exercise the right to concealed carry. In a letter to Idaho Senate president and Lt. Gov. Brad Little, he encouraged the Legislature to monitor the implementation of the law to determine if the lack of a training requirement undermines public safety. Idaho will remain among the 19 states resisting a key provision of Obamacare. The Idaho Legislature adjourned Friday without agreement on whether to explore an expansion of the Medicaid program. Idaho finished picking candidates for the Presidential election last week. Now politics watchers are turning their eyes to the state’s May 17 primary election. The filing deadline for candidates for the Idaho Legislature came and went two weeks ago. The share of Oregonians and Washingtonians without health insurance has dropped dramatically under Obamacare. The uninsured rate is now at a historic low in the West Coast states. Idaho has missed out on that trend, largely because the state until now has refused to expand Medicaid eligibility on the federal dime. 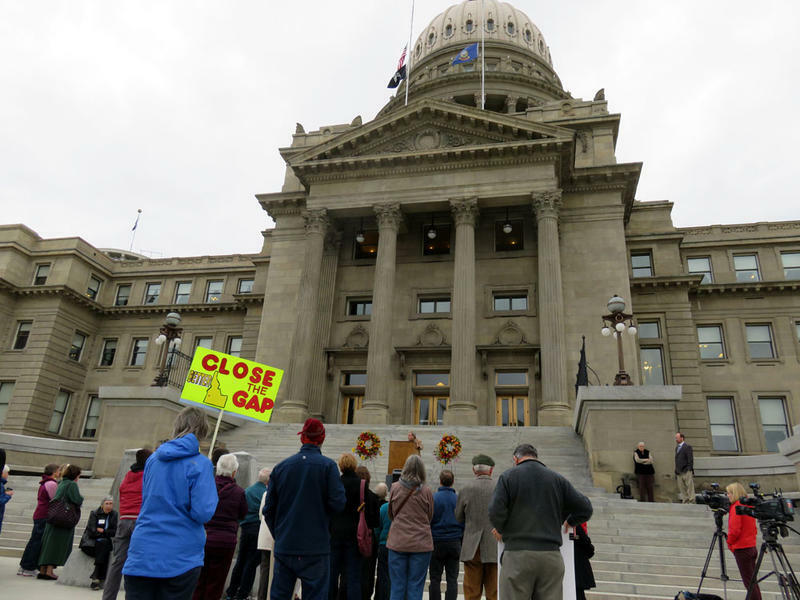 Idaho's Republican-controlled legislature was teetering Friday on whether to end its holdout. State budget writers have signed off on a surprise $8 million request from top legislative leaders to pay for a possible settlement in Idaho's losing legal battle over an illegal statewide contract for broadband in public schools. The Joint Finance Appropriations Committee voted 19-1 on Tuesday to approve the request of House Speaker Scott Bedke and Senate President Pro Tem Brent Hill. Earlier this month, the Idaho Supreme Court upheld a lower court's ruling voiding the $60 million statewide contract in a drawn-out legal process. Bingham County Sheriff Craig Rowland made the comments to Idaho Falls TV station KIDK on Monday before lawmakers unanimously approved the new system and sent the measure to the governor. The North Idaho town of Orofino has asked the Idaho legislature to create a specialty license plate for its high school. No other Idaho high school has its own license plate. The bill has passed the House despite some stiff opposition. Orofino is home to a state mental hospital and many people see the local school mascot, the “Maniacs” as an offensive caricature. The image is a wild-haired, screaming cartoon character jumping in the air. It wears what, to many people, looks like a hospital gown. State budget writers have found a way to finance two crisis centers in southern Idaho to serve as a safety net to treat at-risk mentally ill people whose symptoms often land them in hospitals or jail. The Joint Finance Appropriations Committee voted 16-2 on Wednesday to divert nearly $1.5 million to fund two crisis centers that will likely be located in Boise and Twin Falls. The President Pro Tem of Idaho’s Senate, Brent Hill (R-Rexburg) Tuesday said his greatest disappointment for the current legislative session is that lawmakers have not brought forth a bill to prevent discrimination against the LGBT community that also ensures religious freedom. A week ago Hill told KBSX that negotiations had been going on behind the scenes and that there was still time in the session to present a bill. A national suicide prevention organization and several Idaho groups with the same mission plan to spend Thursday trying to convince Idaho lawmakers to implement four recommendations. Those recommendations are the top priorities from a twelve-point suicide prevention plan created last year by the Idaho Health Quality Planning Commission. The HQPC is a group of healthcare professionals, insurance industry reps and academics that advises Idaho lawmakers on ways to improve healthcare. It has identified suicide as one of the biggest public health threats facing Idaho. We’re more than a month and a half into the 2016 session of Idaho’s legislature. By this point in last year’s session, dozens of protesters had been arrested. They wanted lawmakers to pass a bill making it illegal to discriminate against people based on sexual orientation and gender identity. The year before saw similar protests but this year they’ve been largely absent. Nicole LeFavour, one of the leaders of the Add the Words movement says it’s because a group of senators has been meeting to craft a bill that could get bipartisan support.